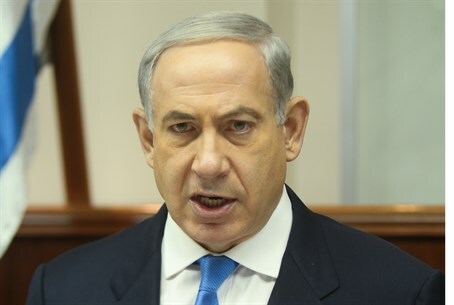 "Incitement and peace do not go together,” wrote prime minister after incendiary statements on PA TV. Prime Minister Binyamin Netanyahu sent a letter Saturday evening to U.S. Secretary of State John Kerry in which he complained that Palestinian Authority (PA) incitement against Israel is continuing even after a return to U.S.-brokered “peace negotiations” between Israel and the PA was announced. Sources said Netanyahu was referring specifically to a recent statement by PA Chairman Mahmoud Abbas, who said that there would not be a single Israeli (i.e., Jew) living within a future PA state, and to a broadcast on PA TV that said the PA state's boundaries would stretch from Rosh Hanikra to Eilat – that is, it would stretch from Israel's northernwestern corner to its southern tip. There have been many other incidents of incitement on PA TV during the renewed "peace talks" as well, as reported by Arutz Sheva. In the most recent such incident, PA TV broadcast a crudely anti-Semitic program legitimising violence against Jews in Judea and Samaria - who were stereotyped as violent thieves. The end of the program glorified the humiliation of a religious Jew by cutting off his peyote side-curls, in a scene chillingly reminiscent of Nazi anti-Jewish propaganda. In other news, Kerry and other top U.S. officials met Thursday evening with a small group of Jewish community leaders to ask for their support for the diplomatic talks between Israel and the Palestinian Authority. The talks are necessary for Israel, he argued, in part because Israel faces the threat of diplomatic isolation if it does not reach a peace deal with the PA.
Talks are scheduled to continue this week. The sides will meet Wednesday in Jerusalem, and the next meeting will be in Jericho.